In response to my call for examples of dubious published numbers that might obey Curmudgeon’s Law of Numerical Fiction, frequent commenter GPR suggested a real gem. The artists Christo and his wife Jeanne- Claude want to construct one of their larger works of art over a river in Colorado. This will, we are told, add just shy of $200 million to the local economy. Although it will take two years to build Over The River, and several months to take it down, the artwork will exist in all its glory for only two weeks. During this time, OTR will attract, the artists claim, 380,000 visitors, 62% of them from out of state. Another 180,000 will show up to see it being built and torn down. This will generate $195.5 million in economic activity, $78.3 million of which will be spent in the Denver metro area. Denver is about two hours from the base of the site, assuming normal traffic, which seems unlikely. 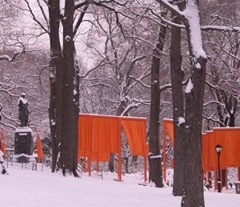 To put these projections into context, consider visitor and spending numbers for Christo and Jeanne-Claude’s last big project, The Gates, installed in New York’s Central Park in February of 2005. Before the event, it was estimated that that work would bring "tens of thousands" of visitors and generate $80 million in additional spending for the NYC economy. By the time it was over those numbers had miraculously grown to 200,000 visitors, including "thousands of foreign tourists", and a $254 million boost to the economy. I think the $80 million number is probably closer to the mark. But even if the spending by visitors was on the scale promised for the Colorado project, it seems hard to imagine that an artwork over a river in rural Colorado will do as much business as one installed in the center of the Big Apple. New York is one of the top tourist destinations in the world. 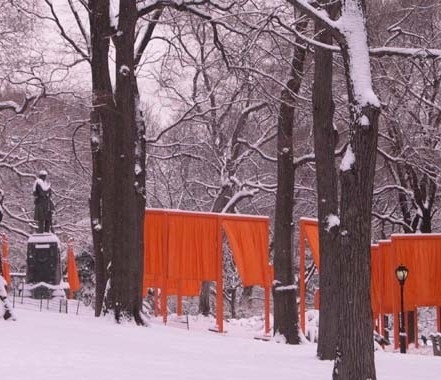 Eight million people could visit the The Gates for the cost of a subway ride. Around another 15 million live within a two hour drive of Central Park. Five million people live in Colorado, most of them more than a two hour drive from the river in question. Even if the projected number of visitors materialized, it’s hard to imagine how the site could accommodate them. The plan is to install the work over a stretch of 40 miles of the Arkansas River between Canon City and Salinas. Access to the site is provided by the two-lane US 50 that runs alongside the river. A line of parked cars, 40 miles long, assuming 12 feet of space and two people per car, would be enough for only 35,200 people. If each visitor spent just one day at the site, or better yet just a few hours, this might be enough to handle the 380,000 predicted, but those economic projections assume that visitors will stay 4-5 days. Of course there will be buses. But consider that the artwork itself, a sort of semi-translucent tent over the river, will cover only 5.9 miles in total. Any back-of-the-envelope calculation will quickly show that if OTR gets the number of visitors expected it will be a logistical nightmare. Which leads me to conclude that the artists either a) consider the nightmare to be part of the work or b) don’t really expect anything like the volume visitors they claim to expect. So let’s review. Curmudgeon’s Law is a three part test. The number must reinforce previously held beliefs. For people who think this project would be, just, like, totally cool, the visitor and spending numbers certainly qualify. The number must be remarkably extreme but still believable. Saying OTR will bring in $20 million to the state, although quite plausible, would be unlikely to garner the support of the entire Colorado Congressional delegation, as it has. And nobody would buy $2 billion. But $200 is just right. And finally, the number must have no organized and credible opposition. This is true here as well. The artists will pay for the entire thing themselves. All they ask for is permission from various government agencies to go ahead. That makes it easy for politicians and other local worthies to back the plan and not look at the numbers too closely. If you don’t live in Colorado, you may think of this as just a modestly amusing story. But chances are your local government already spends your taxes on similar projects that are just like totally cool, based on similar fanciful calculations of economic benefit. Here in Massachusetts, it has recently been discovered that big tax breaks we have been giving Hollywood to film movies on location here return only 16 cents of every tax dollar spent to the local economy. At least we have the sense to make do with our 97 year-old baseball stadium. Economists have been showing that taxpayer subsidized stadia are a universal waste of money for at least a decade now, and yet cities all over the country keep paying to build ever bigger ones. And that is a small waste compared to putting on an Olympics. From the point of view of advocates of cool projects like these, projections of economic benefit are an ideal form of supporting argument. There is little science behind them, so with a set of barely plausible assumptions you can come up with just about any number you need. But what’s really nifty is that there is no moment of reckoning. Even after the fact it is impossible to tell what the economic impact really was. I remember several years ago one of the professional sports teams estimated their economic impact to their city at $100-$200M range. They were trying to get the city to chip in to build a new stadium and making the argument that the team benefited the economy and supporting them is a good investment. If a pro sports team only generated $100-$200M in economic impact a few years ago then I can see no way in the world that temporary art in a rural area would generate anything close to $200M. I assume the pro sports team over estimated their impact also. Hey! I’m famous! Famous I tell you. 1. The $50 million might be privately funded, but hiway crews, cops for directions, etc. — the tax fee will be high. What did the Jackson funeral cost LA? 2. $50 million? Seriously? Seriously? Who gives them all this money? 3. Does my beautiful river really need a dress? (kudos to you, Frank, for ignoring the art issue and sticking to the numbers). According to their website and Wikipedia they pay for everything out of their own pocket by selling their own art. They’ve been doing this kind of thing for decades. Of course more press coverage makes it easier to sell their stuff for more money..
There’s something not quite right with Christonomics. There was a minor buzz after The Gates when some people started trying to figure out how the artists could have possibly spent the $21 Million on it that they claimed. They do make some money on books and prints, but it just doesn’t quite add up. Holy Cow. I live in Colorado and I am not even slightly amused. Since when is 34 miles of “uncovered river” an INTERRUPTION?! How about if we left the other 5.9 miles natural and untouched? Will the sky look just as beautiful or the birds sing as melodically? Will the fish still bite and the rapids still course? Sheesh! This is more than I can stand. Not only do I live in Colorado but I also work for local government.Unfortunately, you are right about the fanciful projected returns for everything from sports tournaments to historical sites to wind farms to – well-art projects. Then of course it is the local government that has to fix the roads, repair the vandalized public restrooms, expand the infrastructure, maintain the money sucking historical sites and somehow tie the two ends of a bloated budget together year after year. There are a few of us local government types who do our best to bring the harsh light of reason to the table. Maybe that is the problem. The light needs to be screened through thin layers of art fabric so we can all see the foolishness for what it really is. I’m afraid all this rant has nothing much to do with your number fiction theme but, no, maybe it does. In some cases the reality of those fictional numbers untimately land on non-fictional people. What is your take on the Tall Ships fiasco? Although I could not convince my wife or any of my friends to actually attend this event, it seems like it was a big draw to Boston. The small incremental cost of pulling the cops off of construction details and putting them on crowd details shouldn’t be all that big a price to pay for the amount of people brought into the city for this event. The kind of people coming to the tall ships aren’t exactly the kind to vandalize or leave a big mess in their wake. Basically the event will fill the otherwise empty $11 a day lots on the South Boston Waterfront and top off the Financial district lots on the other side. It will fill the otherwise empty on weekends Silver line. It will add some traffic to the mostly empty on weekend Commuter rail lines. No Name’s, LTK, and Salvatore’s will be non-stop crowds. No infrastructure to build. No stadia to upgrade. Just provide a police presence and the Tall Ships will provide the tourists and their wallets. We’ll ignore the sexism for now. That NYT article was good. So the cost of the project may also be some Numerical Fiction. I live in this canyon and this project will cost residents a lot of money and waste our precious time. It will make a rich man richer on the backs of the 5000 residents of the canyon. It will also greatly reduce the population of already stressed Rocky Mountain Big Horn Sheep. from the heat, uncover, cool the chicken in the liquid for half an hour.